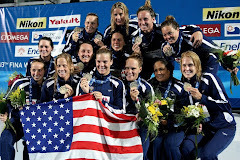 The team of “Milwall Swimming Club”. 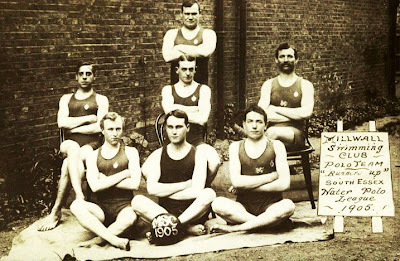 The team based in Berrmodesy, South London was second in the South Essex Water Polo League of 1905. 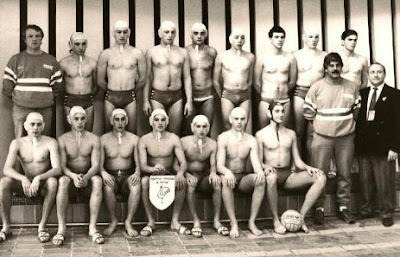 The team of “Neptunes Water Polo Club”, in 1968. Standing L-R: I.Camilleri, P.Falzon, A.Portelli, J.Chetcutti, Mr.Scott (Coach). Kneeling L-R: J.Wismayer, W.Mamo, F.Goulder, A.Grixti, P.Cachia. 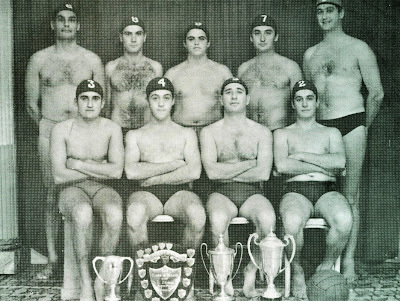 The team of “Neptunes Water Polo Club”, Champions and Cup Winners of Malta in 1964. 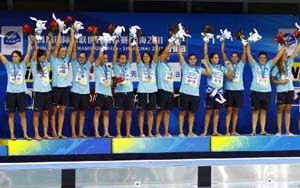 Standing L-R: B.Portelli, C.Calleja, J.Chetcutti, T.Albanese, Michaleff Eynaud. Seating L-R: M.Fenech, A.Ciantar, W.Mamo, J.Wismayer. 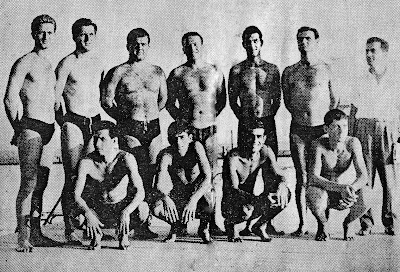 The team of “Neptunes Water Polo Club”, of Malta in 1963. Standing L-R: V.Cachia, A.Gatt. B.Portelli, M.Fenech, J.Chetcuti. Kneeling L-R: J.Wismayer, E.Ellul, W.Mamo. 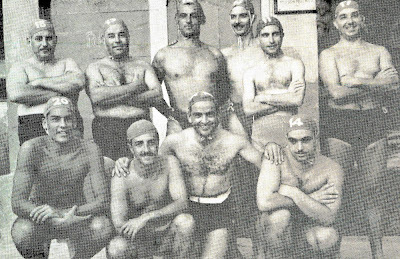 The team of “Neptunes Water Polo Club”, of Malta in 1953. 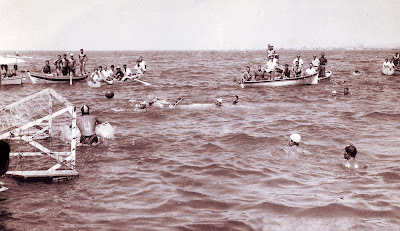 Game in the bay of Salonika for the 1959 Greek Cup between the traditional local teams of “Aris Thessalonikis” and “PAOK Thessalonikis”. The National team of Greece in 1974. 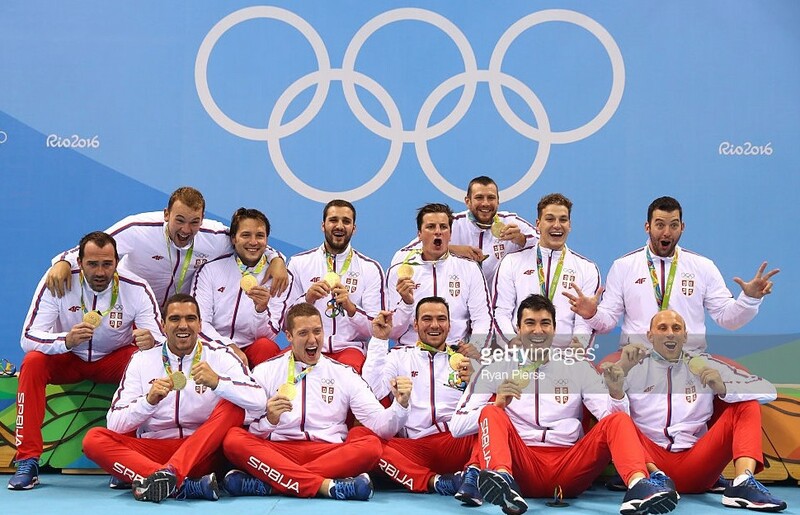 Standing L-R: Vassilis Costoulakos (physio), Andreas Garyfallos (Coach), Periklis Damaskos, Koulis Iosifidis, Takis Michalos, Official, Miltos Elefteriadis, Yiannis Palios, Dimitris Konstas. 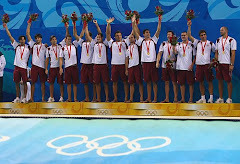 Kneeling L-R: Thomas Karalogos, Anargyros Kehagias, Stathis Sarandos, Spyros Galinos, Yiannis Garyfallos, Yiannis Karalogos and Sotiris Stathakis. 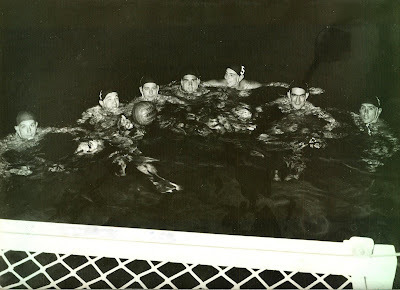 The Champions of “Ethnicos Piraeus” winner of their 12th National Greek title in 1962. Among the players: Manolis Patlakas, Yiannis Thymaras, Petros Kalfamanolis, Andreas Garyfalos, Andreas Kalomiris. 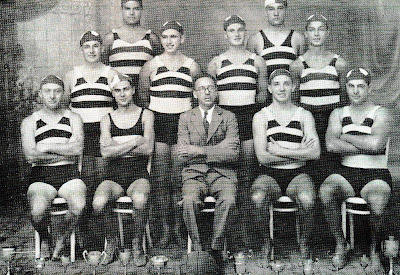 Source: Archive of "Ethnicos Piraeus"
The team of "Club de Gimnasia y Esgrima", Buenos Aires, Champion of Argentina in 1925. From L-R: Ricardo Bustamante, Anibal Vigil, G.Martinez Seeber, Jorge Moreau, Alberto Zorilla, Juan W.Behrensen, Santiago Stipanicic. 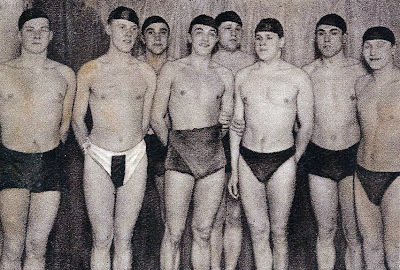 The team of “Hindú Club”, Buenos Aires, in 1933. 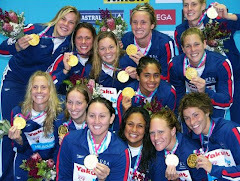 From L-R: Williams Camet, Arouch, Kennedy, Zuckermandl, Beas. Caridad, Ferro, Noou, Guilluy, Milberg, Castelao, Landajo. 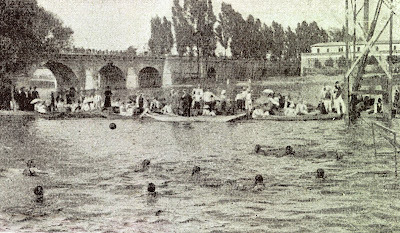 Water Polo match in the “Bandown” Regattas c.1910. 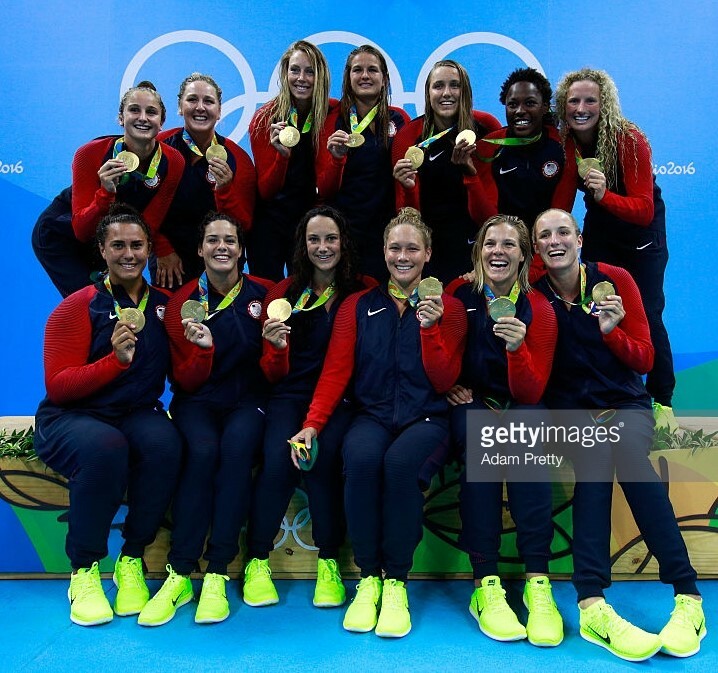 (Note: Location not identified. 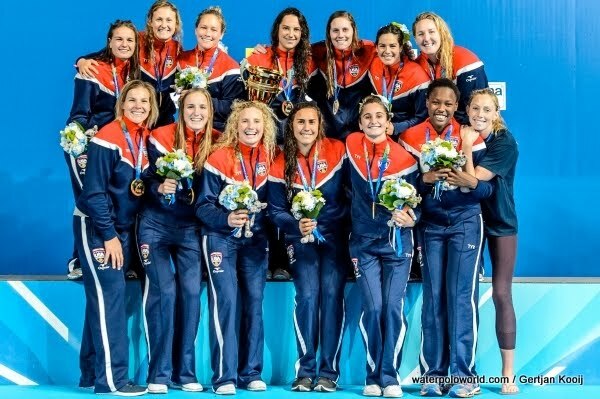 Possibly be in France or UK). 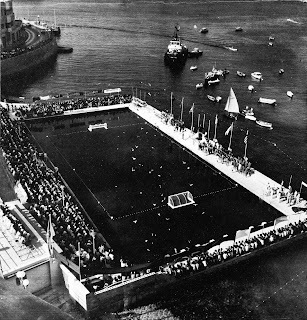 Water Polo match for the French Championship of 1911 held in Joinville-le-Pont, in the south-eastern suburbs of Paris. 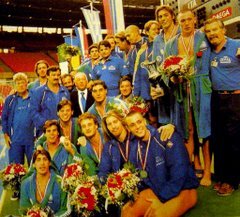 International Water Polo tournament held in the "Neptunes Water Polo Club" from 26 to 30, July 1972 with the participation of the National teams of Greece, Scotland, Israel, Switzerland and Malta. 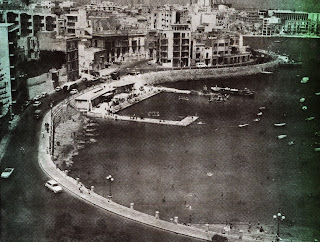 St Julian's, Malta in the 60’s. 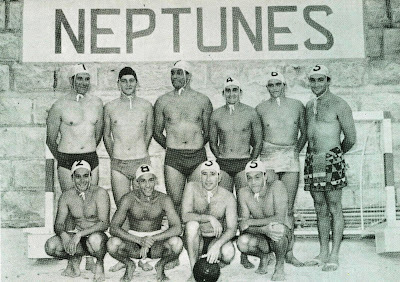 The team of “Neptunes Water Polo Club” winner of the 1949 Championship and Cup in Malta. Standing L-R: F.Wismayer, L.Demajo, J.Albanese, J.Platts, A.Podesta, A.Mizzi, W.Podesta. Kneeling L-R: B.Portelli, L.Wismayer, F.Miggiani, L.Manche. 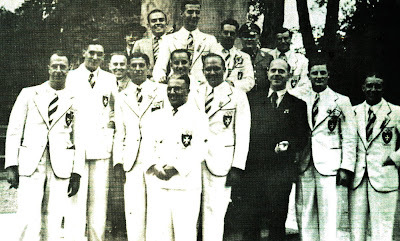 The National team of Malta that took part in Berlin 1936 Olympic Games: Joseph Chetcuti Bonacia, Joseph Demicoli, Anthony J. Lanzon, Arthur Podesta, Wifred Podesta, Fortune “Pippo” Schembri, Sidney Scott and Frank Wismayer, Jack Frendo Azzopardi, C.Parlato, J.Albanese. 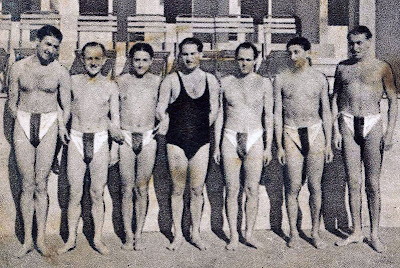 The team of “Neptunes Water Polo Club” Champions of Malta in 1933. 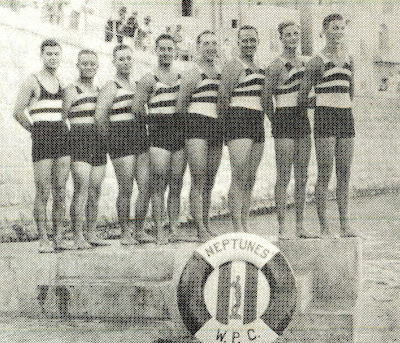 In the 30's, Neptunes won the league Championship on the four occasions they took part. That was in 1933, 1934, 1937 and 1938. 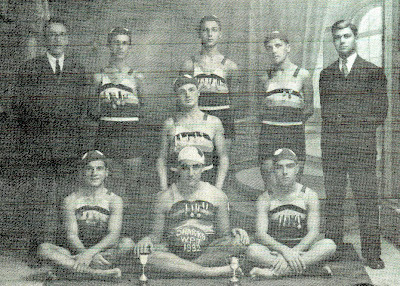 Back row L-R: John Chetcuti, P.Merciera. 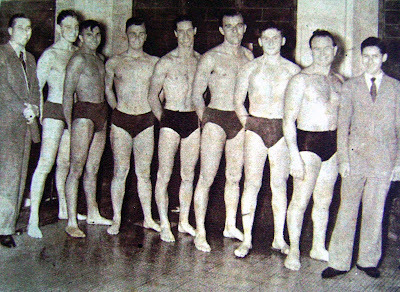 Middle row L-R: F.Wismayer, Jim Chetcuti, Alf Lanzon, A.Podesta. Front row L-R: A.Degiorgio, J.Demarco, Is-sur Fred, W.Podesta, J.Albanese. 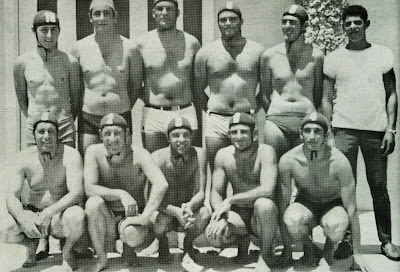 The “Sharks Water Polo team” one of the teams of “Neptunes Water Polo Club” of Malta in 1932. Standing L-R: F.Gauci, J.Griffiths, A.Podesta, E.Xuereb. Center: Alf. Lanzon. Seating L-R: R.Wismayer, P.Merciera, S.Pivitera. 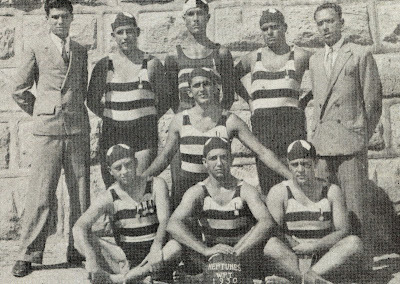 The team of “Neptunes Water Polo Club” of Malta in 1930. Standing L-R: J.Demarco, F.Wismayer, Alfred Gauci, John Chetcuti, F. Gauci. Middle: Jimmy Chetcuti. Seating L-R: A.Degiorgio, W.Podesta, J.Albanese. 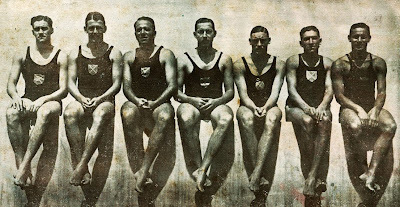 The fist team of “Neptunes Water Polo Club” of Malta in 1929. 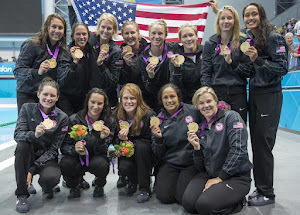 The Neptunes W.P.C. 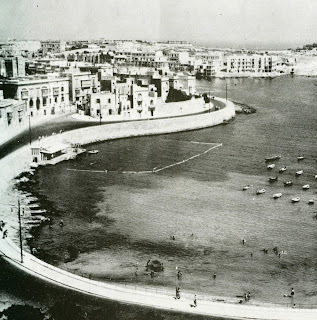 was founded the same year by Mr. Alfred Gauci, called affectionately “is-Sur Fred”, who was its President until 1948. The team of “Club Gimnasia y Esgrima”, Buenos Aires, Champions of Argentina in 1927. 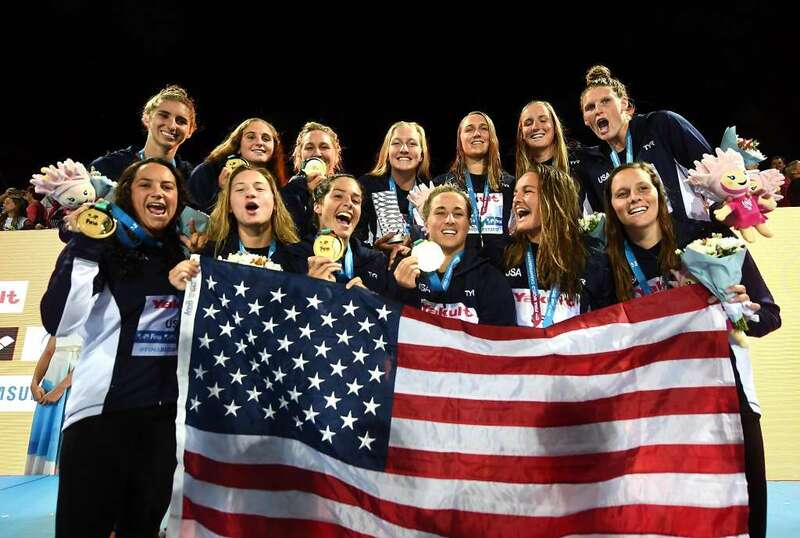 The team winner of its 6th consecutive national title, from L-R: J.Moreau, L.Rovere, R.Bustamante, A.Virgil, Castro Feijoo, H.Cattaruzz, Gambell Burrows. Trading card Star “bonbons Furth, chocolat” with the team of “Hagibor Prague” in 1934. 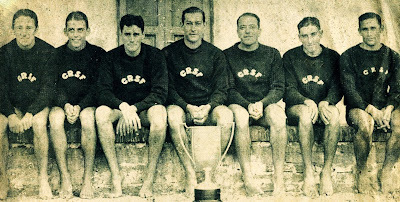 The team of Club Regatas de Santa Fe, called “the untouchables”, winners of the 1930 A’ division Chmapionship of Argentina. From L-R: Samatan, Anibal C.Filiberti, Juan D. Escobar Cello, René Giménez Funes, Gomez Iriondo, Angel D. Bonomo and Juan B. Oliveres. The team of Club Regatas de Santa Fe, Champions of Argentina in 1930. 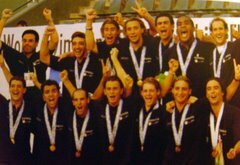 From L-R: Juan D.Escobar Cello, Anibal C.Filiberti, Héctor Iriando (captain), René Giménez Funes, Marcelo Visentin, Angel D. Bonomo and Juan B. Oliveres. 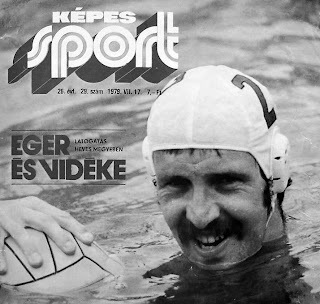 Front cover of the Hungarian Sports magazine “Kepes Sport” presenting the legendary centre forward Istvan Szivos, Jr., winner of gold medal in Montreal 1976, silver in Munich 1972 and bronze medal in Mexico 1968 Olympic Games. 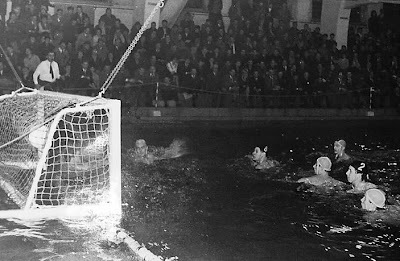 Action in the Alfred Hajos pool of Budapest, during the game of "Ferencvaros Torna Club" and Ujpesti Dozsa (8:2) for the Hungarian Championship of 1965. The team of "Ferencvaros Torna Club" (FTC) of Budapest winner of the 1965 Hungarian Championship. The team: Ambrus, Szivos Jr., Bolvary, Felkai, Lauko, Gyarmati, Karpati. 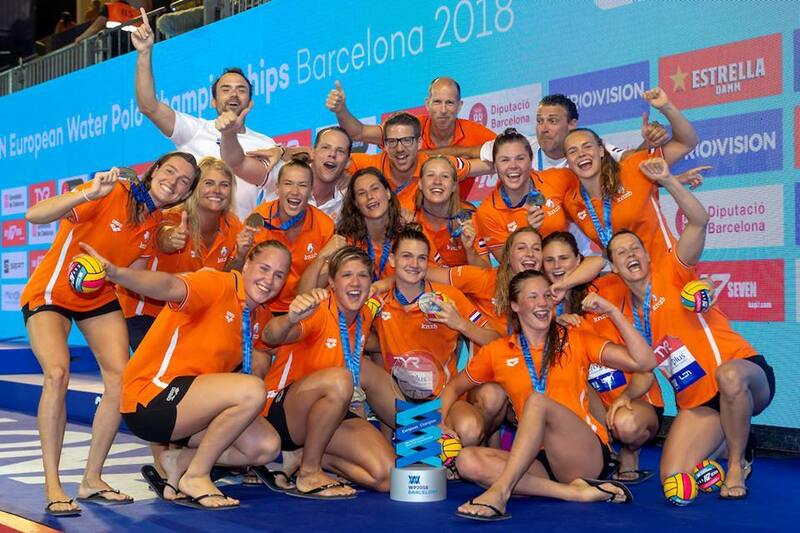 Coach: Dezso Fabian. 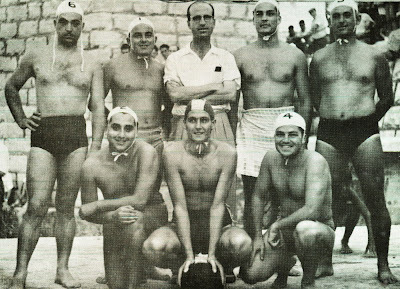 The players of Pro Recco, winners of the 1959 Italian Championship, standing into the boat “Nuova Recco”. 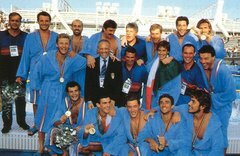 From L-R: Giraldi, Merello, Eraldo Pizzo, Guidotti, Pedarsini, Cevasco, Carnevali, Tabasco, Sogliani, Pozzo, Gandolfo. Captain of the boat (and coach of the team) Piero Pizzo. 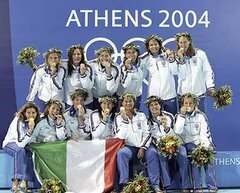 (Missing from the photo Franco Lavoratori).